Intex is one of the most popular manufacturers in the industry of inflatables. It’s highly unlikely that this is the first time you hear of the brand because they created everything from above ground pools, floats&toys, inflatable furniture, Airbeds all the way to boats and they are taking the market by a storm. Hence, it was brought to our attention that they finally produced an extended 5-person boat and we had to try it out. Thus, in this review, we are going to point out the highlights of this boat, the advantages, disadvantages and hopefully everything you need to know to help you make up your mind. 10'4" x 5'5" x 1'5"
While most people feel satisfied knowing a boat can cater for 4, 5 or 6 people, we thought it is slightly more convenient to give you the exact dimensions of this product; that way, you can decide how many people can go on it. Accordingly, the Intex excursion 5 is undeniably large and that is already a comforting idea because this is supposed to be a friends / family boat. However, it is still important that you find out exactly how many people it can take on. 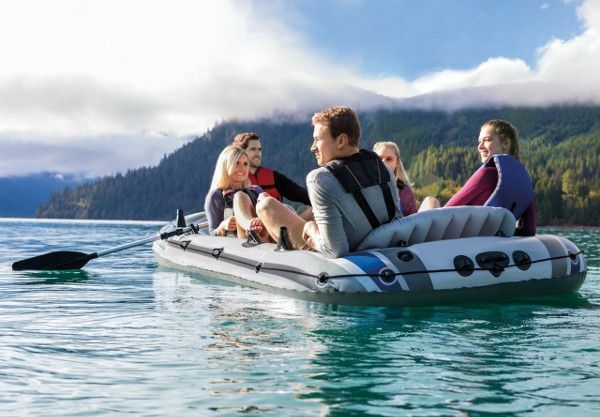 While the company claims that this boat is fully capable of handling 5 people, we’d argue that it would only take on 4 adults and a child comfortably. That being said, the boat at hand is 144 inches long and 66 inches wide which translates to 12 x 5.5 feet. Given this exact piece of information, you should be able to figure out how many of your relatives or friends can get on this boat comfortable, considering that you know their exact sizes. Equally important, the fact that the length to width ratio on this boat is similar to that of a standard whitewash Colorado raft, it is made far tougher and consequently harder to capsize even in strong currents. Nonetheless, that will not stop a passenger from falling off in distress. A customer’s primary concern when purchasing an inflatable product is quality and you are absolutely right about that. Indeed, the quality of an inflatable product is especially important because anything inflatable is vulnerable; or is it? Well, since military zodiacs take the first spot when it comes to the toughest inflatable gear, domestic inflatable boats like the Intex excursion 5 had to embrace the second spot. Fortunately however, you can tell that even an affordable domestic inflatable boat like this one has learned a lot from the military elite. In fact, the Intex Excursion 5 is made of powerful vinyl and that takes durability up a notch since it is a high-grade material known for its rigidity and durability. To give you a better idea of what to expect from this boat, note that the vinyl base material is developed under high intensity from crude oil and chlorine to make this PVC resin fusion that will easily take on any challenging environment. PS: The load capacity on this boat is a staggering 1,100 pounds. Like any reasonable buyer, you must care at least a little about the features of a product since it is something that you’ll hopefully use as often as possible in appropriate seasons. 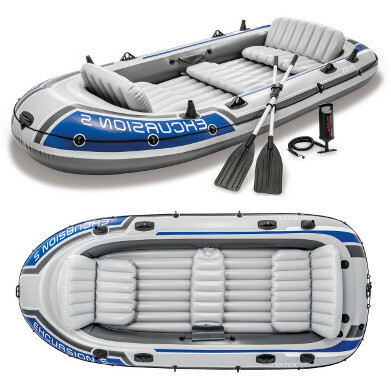 In that concern, let us take a moment and dive deep into the features of the Intex Excursion 5 and unravel what makes it a great inflatable boat. If you love fishing or want to try it out then you’re going to love the fact that this boat comes with four fishing rod holders for an easy and comfortable fishing experience. So, feel free to enjoy long fishing afternoon with your friends or kids with enough fishing spots for everyone. For safety measures, the board comes with a 360° grab-line to help you get back on the boat easily in case you’ve fallen off or dived off. Accordingly, you can relax when you have children or non-functional adults on board because worst case scenario, they’ll get wet. Like any boat out there, the Intex Excursion 5 comes with 2 oar holders for an easier motion and better paddling. Thus, you don’t have to struggle in order to keep the oars in place as you go and that’s already a huge advantage. If you’re planning on taking the high way, then you can always attach a trolling motor on this boat. 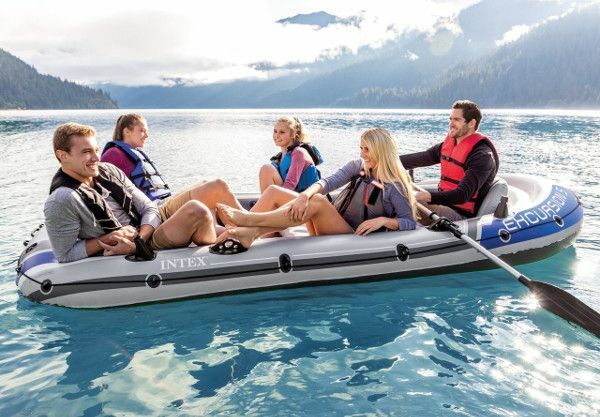 Surprisingly, the Intex at hand is one of the few entry level inflatable boats that comes with a motor mount. So, lay back and prepare to cruise around comfortably with the Intex Excursion 5. As far as performance goes, you shouldn’t be surprised to learn that the Intex Excursion 5 is not so competitive. Indeed, this boat was designed with an image of a relaxing family / group of friends on a calm setting and that makes it useless for extreme sport lovers or competitive people. Other than that, the Intex Excursion 5 is not bad at all for a laid back summer holiday, relaxation and easy drifting which depends a whole lot on the width aspect. Truly, because it is almost 6 feet wide, you never have to worry all that much about the boat capsizing. 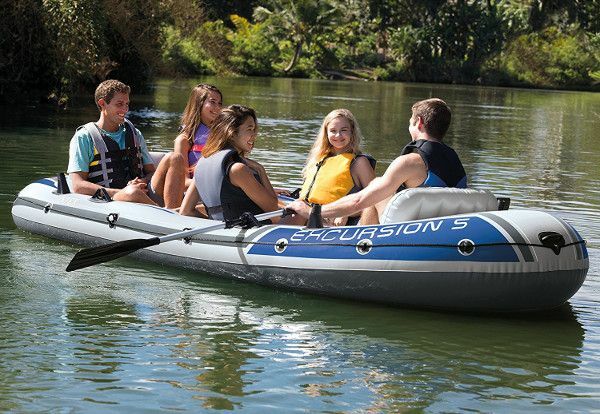 The Exursion 5 comes in one awesome package that includes inflatable cushions for the boat. It also comes with 2 paddles. It’s featured with motor mounts fitting. There are 2 fishing rod handles. It can hold up to 1,100 lbs. And it’s NMMA and TUV certified. This boat will take you a while to inflate. It’s recommended that you invest in an electric pump to save yourself from the hassle of manually inflating it.